Loose Dry avalanches exist throughout the terrain, release at or below the trigger point, and can run in densely-treed areas. Avoid very steep slopes and terrain traps such as cliffs, gullies, or tree wells. The soft snow layers from Tuesday morning and Wednesday morning are failing on buried surface hoar that was laid on top of the knife hard crust. This crust is an excellent bed surface for sliding snow. Above 6,000 feet elevation, weather forecasts call heavy wet snow to accumulate to 4" to 18 inches by Saturday. This will result in an inverted density surface snowpack. 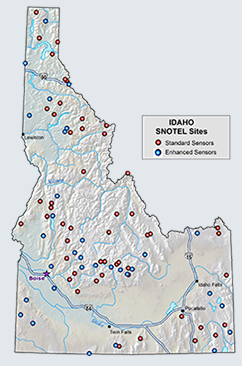 The current upper snowpack layers are already sensitive to stress. This situation will be aggravated by the Friday-Saturday storm event. Today we observed good evidence of the deep persistent slab located above the benchmark Thanksgiving rain crust. Although it currently requires hard force to release this deep slab, it does so cleanly and across the whole column. Below 6,000 feet elevation, heavy rain on snow is forecasted Friday through Saturday. Such events can be catastrophic to the snowpack, causing wet slab releases often to the ground. Our current snowpack conditions reveal near surface instability associated with new snow overlaying hard crusts. These release cleanly with easy force. Lurking deep below is a persistent slab we have been tracking for nearly a month. Both of these snowpack problems will be severely tested by the Friday-Saturday forecasted storm. This storm will bring heavy wet snow to elevations above 6,000 feet and heavy rain on snow below that elevation. Recall that rain on snow that results in free water percolating down through the snowpack is one of the most destructive forces to snowpack stability. We fully expect to see a major cycle of wet slab releases starting late Friday and through Saturday. Travel in avalanche terrain during is not recommended during this rain on snow events. These events can be hugely destructive as evidenced by their debris fields (trees, rocks, snow). Today I visited Meadow Peak (33 air miles southeast of Libby). 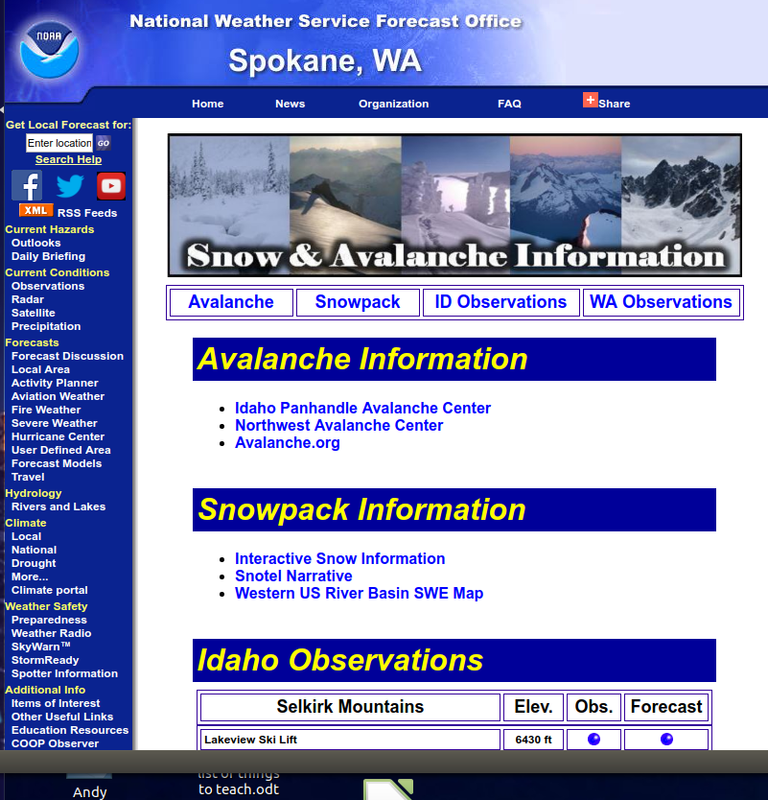 At 6,709 feet elevation, I found 59 inches of snowpack. The top 3 inches is new snow from overnight. Below this is 3 inches of soft snow from Tuesday AM. These soft surface layers sit atop a two knife hard crusts totalling 4 inches. These crusts were not penetrated by snowmobile or ski, and only rarely by boot. Below the knife crusts are several pencil hard layers totalling 30 inches in depth. These pencil hard layers sit on the Thanksgiving rain crust that continues to be knife hard at this location. Below the Thanksgiving crust are several pencil hard layers totalling 9 inches in depth. The final 8 inches of snowpack is loosely consolidated large angular crystals. The Extended Column Test produced a Quality 1 shear (blue card on knife crust) at the new snow - knife crust interface. This was after 5 wrist taps and produced NO propagation. The failing layer was 2-4mm buried surface hoar. After 10 wrist taps, a Quality 2 shear was produced between the two knife crusts in a thin soft snow layer. NO propagation was evident. After 8 shoulder slams, a Quality 1 shear was produced at 35 inches from the surface with FULL propagation across the column. The failing layer was a very small (1mm) angular plate. This would be the deep persitent slab we have been discussing in previous advisories. Since the Tuesday February 3rd advisory, weather in the Kootenai Region has been warm and wet. All Snotel sites are reporting above freezing temperatures since Wednesday PM, with mid 30s F very common. Most Snotel sites are reporting moderate increases in SWE (0.5"-1.0 inches). Banfield Mountain in the Purcells is reporting a 0.3 inch increase in SWE. Overnight southwest winds have transported significant snow to easterly aspects. Weather today at Meadow Peak 6,709 feet elevation (33 air miles southeast of Libby) was cloudy with light snow, southwest winds 10-15 mph, 30'F, and 3 inches of new snow. Winds had transported much new snow overnight. Forecast through Saturday calls for 100% cloud cover, above freezing temperatures day and night, southwest winds 21-28 mph, and 100% chance of rain below 6,000 feet elevation with over 2 inches of precipitation. Snow above 6,000 feet will be very wet and could accumulate to 18 inches.